Trail camera surveys are a great tool that provide a wealth of information about white-tailed deer and other wildlife on your property. You can gather information about deer population density, doe-to-buck ratio, and fawn recruitment, which may ultimately help guide management decisions on your property. 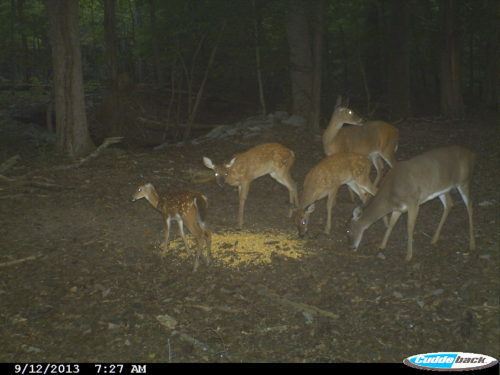 Here are a few tips when conducting a trail camera survey for deer. When analyzing camera data from a survey, based on antler characteristics you can then determine the number of unique bucks captured during the survey. You also need to determine the total number of bucks, does, and fawns in all the photos. This will help you determine density, doe-to-buck ratios, and fawn recruitment (fawn-to-doe ratio). For easy data analysis check out this Trail Camera Data Computation Form from the Quality Deer Management Association. Trail camera surveys can be a fun activity for you and your family to do prior to or after the hunting season. They can also provide you with information about deer and other wildlife that are using your property. *Before conducting a baited camera survey be sure to check the wildlife feeding and baiting laws in your state. For the state of Indiana you can find this information in the Indiana Hunting & Trapping Guide.